The experiment is described here. Results will be presented later. Any suggestions about the experimental design are welcome. This part presents an experiment in which I attempt to answer the question of how consistent date stamp angles are when a document like Obama’s is stamped. 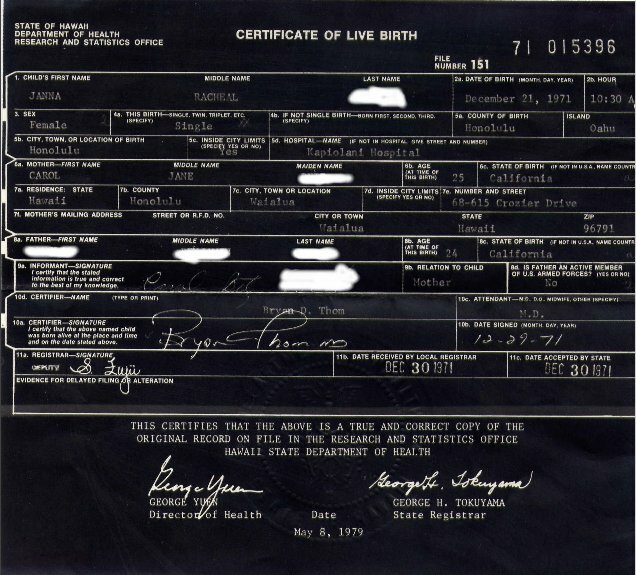 I begin with some assumptions: The first is that the person who stamped the date in Box 20, “Date accepted by Local Reg.” is same person who signed Box 21, “Signature of Local Registrar.” That means that the same person who stamped Obama’s certificate also stamped that of Johanna Ah’nee, the one Mike Zullo said was copied for part of a putative fake Obama certificate. 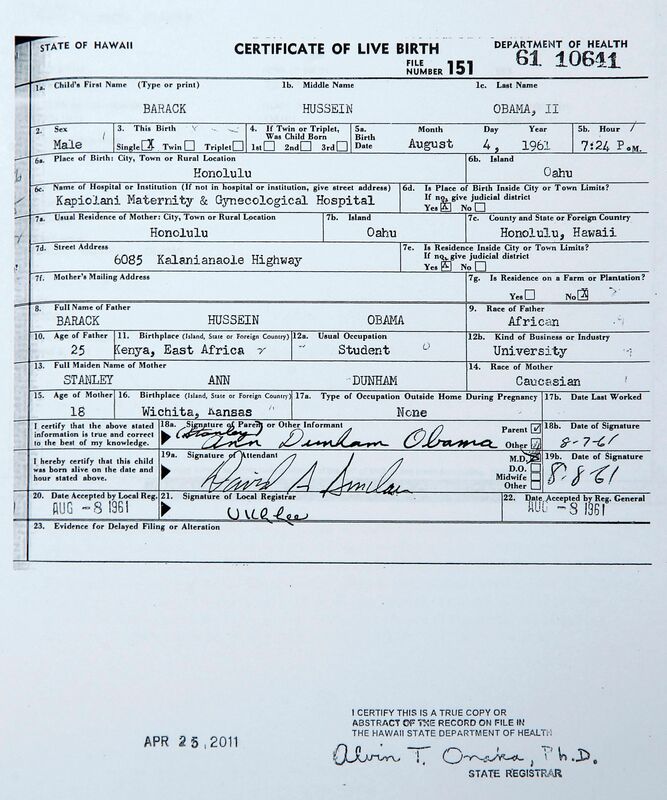 Indeed, most published birth certificates contemporary with Obama’s were signed by “V. K. Lee” and I’m going to conclude that she signed literally thousands of birth certificates every year. That was her job, stamping dates on Box 20, day in and day out, year in and year out. Such repetitive tasks will create muscle memory and they can be completed with little conscious effort. Lee had been signing certificates for years before Obama was born. Pick up a rubber stamp and stamp inside Box 20. Repeat the entire procedure 4 more times, completing all 50 forms. I am making the “blank” form available as a PDF file so that others can check my results. 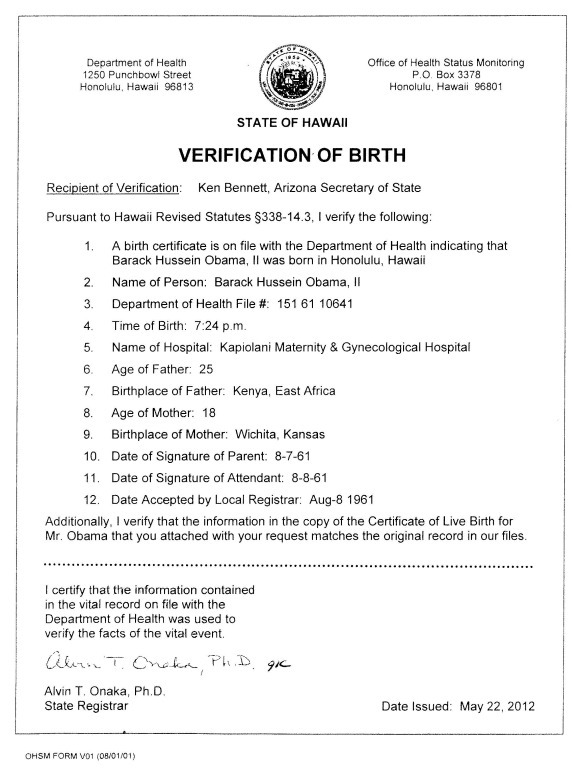 (The text “Kapiolani Maternity & Gynecological Hospital” was left on the form for scaling purposes.) 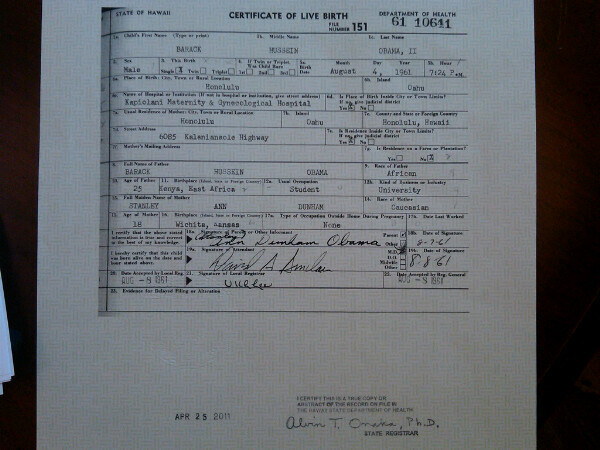 Note that my form is bigger than Obama’s birth certificate because it’s not reduced like the birth certificate. I can determine actual size by the 10 characters per inch spacing of the typewriter font. The next experimental concern is measuring the stamp angle and assessing the margin of error in that measurement. Ms. Conspiracy (who also holds the MS degree) offered a criticism of the experimental design. She felt that rather than pick up a stamp, a pen, a stamp, a pen, etc. that an office worker would stamp them all, then sign them all. So I did an additional run of 20 forms stamped without putting the date stamp down. These weren’t signed. The two trials were named Experiment 1 and Experiment 2 respectively and the forms for review are in the order stamped. It seemed that variation was more caused by the angle at which the stamp was grasped, than the position of the arm. Paper positioning is also a source of variation. I was surprised in the amount of variation in angle seen in Experiment 2. I’m not sure why. The forms in Experiment 1 were printed directly from the “paint” program. That program then printed to PDF and the PDF was printed for Experiment 2. The two forms are not exactly the same size. In your experiment, will your forms include the space on the left where some of the medical and other data go? My only suggestion would be to ask someone else to stamp the certificates. Preferably it would be someone who has no clue why you are doing it. That would make it somewhat of a blind test. The problem is that a volunteer might try to perfectly align the stamps in the box. How could you explain to the volunteer not to do that without essentially explaining the experiment? At least in my design, I can’t look at what was stamped before to copy it visually. Reality Check: My only suggestion would be to ask someone else to stamp the certificates. Preferably it would be someone who has no clue why you are doing it. That would make it somewhat of a blind test. In addition to his many character flaws, no one voted for ex-con Judy in 2016 because he appeared on no ballot. Unnecessary, because the person stamping and signing the birth certificate forms knew exactly what they were stamping and signing, after years in the job they’d be zeroed in on the fields they needed to complete to issue the certificate. I should have made a contribution to his campaign. Then I could have sued him for spending the money on Happy Meals. Did you also stamp box 22? As in stamp, stamp, sign. I suppose I was trying to anticipate the Birthers claiming Doc rigged the test somehow. I look forward to Part 3! Craig HS: Unnecessary, because the person stamping and signing the birth certificate forms knew exactly what they were stamping and signing, after years in the job they’d be zeroed in on the fields they needed to complete to issue the certificate. It seems unlikely that I will finish this article by noon tomorrow due to some lengthy tasks I have to accomplish in real life before then. I’ll post the results when it’s done. Maybe we’ll have a March reveal? Heh, no, not that long. I am assuming that the two stamp users were not the same person. Sometimes I see one stamped and one handwritten, or different dates. gorefan: Did you also stamp box 22? No. I do not know whether form is two-sided or oversized. In any case, I can’t scale the form to its original size and include that material, no room. Northland10: In your experiment, will your forms include the space on the left where some of the medical and other data go? Quite a collection of alternate designs here. Very old. The problem was recognized a heck of a long time before 1961. Remember this is a task that they had to do A LOT. Other than the possibility I have proposed that they used an electric stamping machine it also occurs to me that the clerk would have been carefully trained to do as consistent a job as possible. They KNOW they are working on historical documents and that it is important to keep it neat, for pride if for nothing else. Your experimental results that have really bad angles or dates that missed the box in a substantial way speak to the stereotypical image we all have of a mindless, bored clerk, stamping, stamping, stamping, stamping, while daydreaming of a beach somewhere in the South Pacific. But that is a false stereotype, and I am sure that if the clerk made too many sloppy errors he/she wouldn’t be doing that job for very long. Care would be taken to get each one right. That doesn’t mean that each one was identical, but they wouldn’t be at the widely skewed angles or the badly misaligned examples your results show. The angles we see suggest to me that no one was intentionally making them pretty. I agree that some of my outliers are beyond acceptable in a real certificate. One big factor is that unlike Lee, I didn’t sign tens of thousands of practice certificates before I started the experiment. Keith: Care would be taken to get each one right. That doesn’t mean that each one was identical, but they wouldn’t be at the widely skewed angles or the badly misaligned examples your results show. Are your outliers more similar to the Nordyke stamps? We know the form extends tp the left of what is shown on a LFBC. There is a printed ? to the left of box 7a. Are those for births at Kapiolani? Are the dates the same? No stamps were applied at Kapi’olani. Registration is a function of the jurisdiction. gorefan: Are those for births at Kapiolani? Are the dates the same? 1: Enlarging the form to the point that typewriter is Pica spacing, I fill up 8 1/2 inches in width. 2. The additional information on the left lacks labels, and it would appear that the extension of the form would be “pretty wide.” I had always assumed it was a full sheet. 3. The gutter of the bound volume is outside the picture, so this extra stuff is to the right of the gutter. 4. 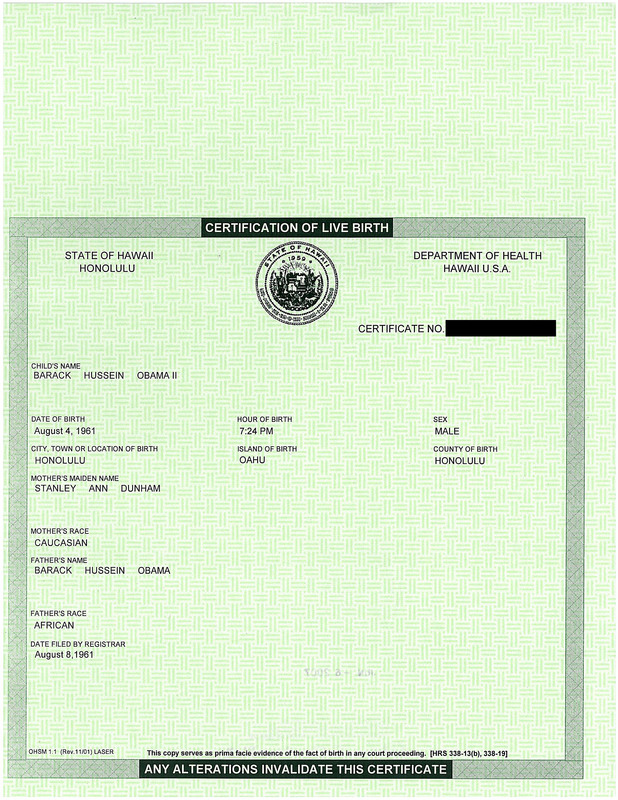 If the width of the additional portion is a full sheet and it were bound at its full width, then were would be no shaded gutter in the image of the birth certificate. I suppose the certificate could be in landscape orientation and the additional information limited – say an couple of inches. If so, that changes the experiment considerably. gorefan: We know the form extends tp the left of what is shown on a LFBC. There is a printed ? to the left of box 7a. I inderstand that the registrar stamped them but as I recall when the two stamps differ they were from hospitals other then Kapiolani. Tripler Army Hospital for example. Zoom in to the left of box 7a is Verna Lee’s handwritten “2”. So she coded something. And to the left of box 7d is a printed “?” so there is a question being asked. IMO the form is more likely 11 or 14 inches wide. 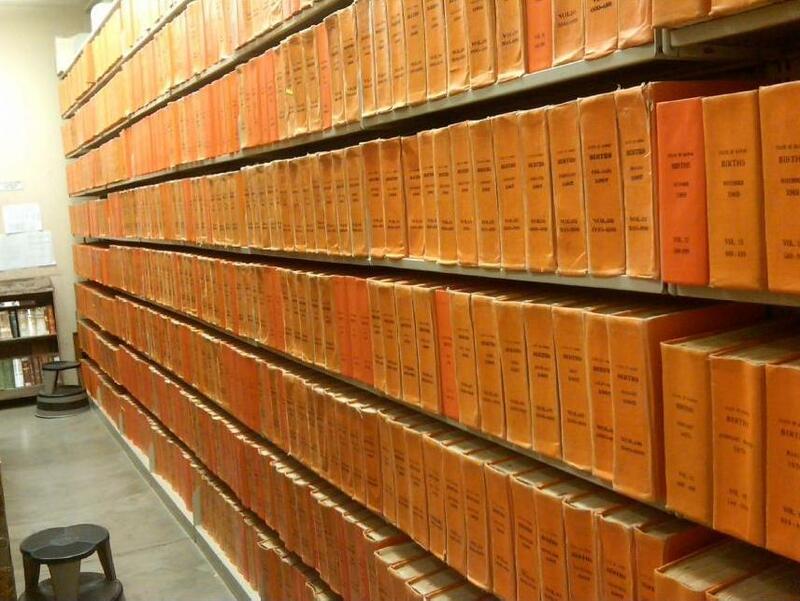 I read somewhere that the bound volumes in Hawaii contain 500 certificates. That’s quite a lot and would make for a thick volume to open up for copying, and indeed if they forms are 8 1/2″ wide one might expect the photocopy gap to be more extreme than we see. gorefan: IMO the form is more likely 11 or 14 inches wide. 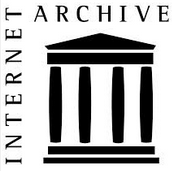 I read somewhere that the bound volumes in Hawaii contain 500 certificates. That’s quite a lot and would make for a thick volume to open up for copying, and indeed if they forms are 8 1/2″ wide one might expect the photocopy to be more extreme than we see. This doesn’t show width but gives an idea of height. Less than 11 inches? gorefan: This doesn’t show width but gives an idea of height.Less than 11 inches? Does add much info but interesting. My guess is that the certificates are hole punched at the top and bound horizontally with the top as the bound edge. There is less wasted space for the holes by binding along a short edge. I have seen documents done this way. It would be nice to find a picture that shows a complete binder. Never mind. I forgot that you can see from the curvature they are bound on the left. I must not be awake! More coffee! My guess is that the covers are not ridged but flexible. Allowing only the right half of the certificate to be placed on the copier platen. Look at this image of Director Fuddy and the binders. The one on the left top visible shelf has been fixed with tape. I suspect there are three holes along the left margin that allows the certificates to be removed individually from the binder. That may be true but most of the certificates we have seen look like there were copied while still in the binder. gorefan: I suspect there are three holes along the left margin that allows the certificates to be removed individually from the binder. Certainly true for certificates from the 1960s but look at this 1971 certificate issued in 1979 (when they still made photostatic copies). It seems flat to me.